It was a frustrating start to the new season for Northants as their opening Specsavers County Championship game with Sussex ended in a draw after two days lost to a wet outfield. But the undoubted high point was a brilliant innings of 282 not out by Ben Duckett, as the County amassed 481 for seven in their unfinished first innings. The young left-hander’s knock was the eighth-highest individual score for the club, and thanks to the weather he was left stranded 49 runs short of Mike Hussey’s record 331 not out. It was an innings of class, and Ripley paid tribute to his opener, saying: “Ben showed lots of qualities during that innings. “Sussex have one of the best new-ball bowlers in the country, and he not only blunted him but scored freely on the first morning. “And when they bowled better to him, he was patient and sat in but showed that greedy side you need to make a big score. “He also didn’t get bored. We can get ahead of ourselves as a batting group, but Ben just kept ticking and showed great desire and attitude. Duckett’s innings helped Northants to a big first innings score, having been asked to bat first. “We thought we’d end up batting first because it’s April and there’s generally something in the wicket for the side bowling first,” said Ripley. “But we got a good batting track and we made full use of it. Sussex perhaps weren’t as cutting as they would have liked but we take the credit for blunting that. “The frustration is you never know what a wicket is going to do until both sides have bowled on it, and we didn’t get the opportunity to have a go with the ball. Instead, no play was possible on the final two days of the match, and the chance to put the title-favourites under pressure was lost. The circumstances of the lost play were very frustrating, with water having seeped under the new covers the club are using for the first time this season, affecting the bowlers’ run-ups. “We’ve had two dry days and not played any cricket and that’s not ideal for anybody,” said Ripley. Northants now have a week off before they travel to Chelmsford for their next Championship match. Despite that break, Ripley feels he may still be without the injured players that missed the Sussex fixture, namely Steven Crook, Rob Keogh, Olly Stone and Rob Newton. 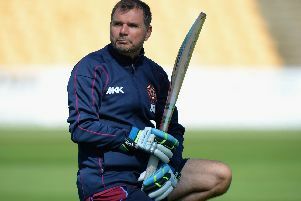 “I’m not over-confident that the lads who missed this week will be back for that fixture,” said the Northants coach. “The break helps, but it does mean that we have more cricket to play in the middle part of the summer when that might be a better time to give bodies more chance to recover.